The peeps are still in a bad way. In fact, they are pathetic. TW has a double whammy: sinusitis AND bronchitis and has been having tummy problems as well. I think she may have horked up a hairball yesterday. I've spent some time in bed with her trying to get her to play with me nurse her back to health. Luckily, there's plenty of food in the house for me; although the peeps are running short. Hope they don't start eating MY food! I can't wait for TW to start playing with me again. I even had to punk out on #Nipclub last night even though they had a really cool theme cos she didn't want to feel up to helping me. Katie might think she has it bad with a Cat Sitter but I'd take a smelly Cat Sitter over humans that do not respond to my wishes. I am being so neglected and ignored. Woe is the pussycat. I still love all my furrends and hope to start commenting soon. Oh Cathy! I'm so sorry you're being ignored. If they didn't need you to nurse them so badly, I'd say come to my house for the duration. Mom would spoil you rotten! I am so sorry to hear that your life is so miserable. Perhaps you need to HELP TW? She is feeling pretty poorly. She helps you. Mom fell asleep in the chair last night. We took advantage of the situation and sat in her lap. I suggest you take advantage of TW's bed situation as well. Although human hairballs are really nasty and disturb our sleep. We're so sorry your peeps aren't well. We hope they get better very soon. You look very cute in that hat! cathy keisha...87 pounds oh trout two ewe if yur mom ore dad eatz yur food...N we meen da CANNED or kibble !!! we triple cat dare em two !!! OMD Keisha you are being sorely neglected. Move in with Katie we say. Joking apart we hope peeps is better soon. Our paws are crossed she can rest up and be back beckoning to your every whim soon. Have a fabulous Friday. If your human is sick all the time, maybe you should think about replacing her? Sending our best purrs to the peeps. Hope they feel better soon and sure hope they don't start eating your fuds. Take care. We think you and Katie should teleport over. We don't mind you harassing our Mommy. Rwally. Awwww , CK I sure hope your servant´s , I mean peeps is feeling better real soon ! Sheesh, CK! We sure hope the peeps are feeling better soon...for your sake! We hope your peeps start feeling better soon. They sure sound like they're a lot of work for you right now! Take good care of them and we're sure they'll be up and about before you know it -- but not soon enough. I sure do hope the normal and all better find your place really soon CK! Aww poor Cathy Keisha! We hope your peeps get better soon! Bronchitis is NOT fun at all! I used to get that every stinking year! Then I got a pneumonia shot and haven't had it since. I think they should call it the pneumonia/bronchitis shot! We hope you get some playtime soon! Oh CK! Me and Mommy is sending yous lots of patience and purrs! Me hates it when our pawrents gets sick and we hopes they don't eats YOUR foods! So sorry your parents still aren't feeling well. Our mom is still sick - now she has shingles! What are we going to do with them? Hang in there CK! Hope your peeps feel better soon! Oh dear, you and Katie are having some awful days. I hope everything gets better all around - very soon! Cody and I feel sooooooooo bad for your peeps!! It took Mom around 2 weeks to get over hers!!! Get some rest! Priorities, my friend, and sick humans must take top priority. We'll all be here when they're well again. woo woo! Oh no I am so sorry your peeps are still sick. I hope they get better before they run out of their food and start eating yours! Oh CK! I am still all alone and won't see my mommy till this late afternoon as she slogs thru the rain every mile to get back home to me. My sitter did come but I am fixed in place where the mouse is and refused to play of be petted. That was a first. All I want to do is wait on the mouse in the spare room. Your sick duties and my job as mouser. What would they do without us? CK, we hope your peeps get to feeling better SOON and that your life returns to normal just as quickly! Sick hoomans are kinda pathetic ... MOL! I hope your humanz feel better soon..being ignored is not in a kitties vocabulary!! CK, only you can bring TW and Pops back from the brink of extinction...stick with them...keep them warm...make sure they eat, drink lots of water and clean your litter box...just a thought...might wanna make sure they don't forget you need that done...na'mean?? Faraday: Mowzers, CK! That's some job you have going there. Those humans can be pretty tiresome too. Have you thought of trading in on ebay? If you do, let us know, cuz our mom is SO neglectful. Allie: Ignore Faraday. I always do. 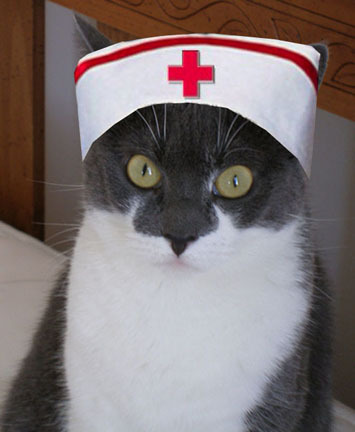 What he SHOULD have said was that we hope your pops and TW feel better soon and that you are a pawesome nurse! CK, You are very strong!!! !